The winners of the CPS competition will go on for an all-expense paid trip to the national competition in Washington, D.C., in June at the US Department of Education. 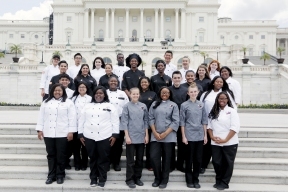 Last year’s winning team from Chicago won third place at the national competition and the students had the opportunity to visit Representative Davis and Senator Durbin and also visited the White House kitchen. 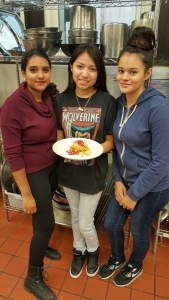 “We had a lot of fun working together and coming up a recipe we hope the judges at the competition will enjoy,” said Senior at Roosevelt High School Victoria Montanez, 19. “I love to cook. I love to work with people, so this experience has been fun.” Seniors Jessica Moreno, 17 and Sara Muñoz, 17 echoed the same sentiments. “It’s fun and challenging at the same time because we were given restrictions on what ingredients we can use,” said Muñoz. “So we really had to think outside the box.” For Moreno, the best part of the experience is the competition itself. “I participated in the competition last year and it was so much fun introducing our recipe to the judges and in front of others,” said Moreno. “The whole process helps to build confidence.” The three ladies created a tropical recipe using tuna as the main ingredient. “I like tuna and you can use it in different ways,” said Montanez. “We decided to do a tuna fritter using Cajun spices. It’s delicious.” The Cooking Up Change competition is a free event and open to the public. For more information on the campaign, visit www.healthyschoolscampaign.org. Photo Caption: (Left to right) Victoria Montanez, 19, Jessica Moreno, 17, and Sara Muñoz, 17.